The south entrance to Yellowstone National Park is along the triply named highway US 89/191/287 from Jackson Hole and Grand Teton National Park. The Teton range falls away as the Yellowstone boundary approaches, and instead the land is more gently hilly, and quite densely forested. Two miles before the entrance station a side road (FR 261) branches off to the west, into the Targhee National Forest, at first passing a few holiday homes and lodges, then becoming unpaved as it approaches Grassy Lake. Along here are several excellent national forest campgrounds, tucked away in clearings in the woods, and these are the best options for free camping in the area. The main road northwards follows the valley of the Lewis River, which meets the Snake River just after the park entrance. The first point of interest, reachable by a very short trail, is an impressive 30 foot waterfall (Moose Falls), formed by Crawfish Creek, a small tributary stream. Past here, both sides of the highway remain heavily wooded (lodgepole pine) though with some clear patches resulting from forest fires, the most significant in recent years being in 1988 - a fire which burned 36% of all trees in Yellowstone. On the left, above the side of the valley, the land becomes quite flat as the woodland gives way to the level, treeless Pitchstone Plateau, while the right side is a lot steeper, and rises to 10,308 foot Mount Sheridan - part of the Red Mountains, named after the predominant color of their constituent volcanic rocks. The road offers several viewpoints of the steep-sided Lewis River Canyon though there is not much else to see for several miles. 11 miles from the entrance, the road reaches scenic Lewis Lake, one of two lakes in the park where boating is allowed. Just south of here is an 85 site NPS campground, situated in woodland on a small hill overlooking but out of site of the Lewis River. 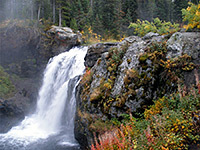 Also nearby are Lewis Falls, where the river cascades 30 feet down a bouldery slope, and a few hot springs, on the far side of the river just as it meets the lake. 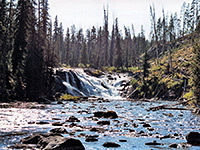 There are several trails in this region; one westwards towards Shoshone Lake, a longer route to one of Yellowstone's backcountry geyser basins (Heart Lake), and the short, quite popular path to Riddle Lake, where bears are often spotted. North of the Lewis Lake, the highway crosses the continental divide, peaking at nearly 8,000 feet then descends towards Yellowstone Lake. The lake is the largest in the USA at this elevation, with a surface level of 7,733 feet and a maximum depth of 310 feet, in West Thumb Bay. The shoreline stretches for 110 miles of which one third is accessible by the road, another third (the east side) by the Shoreline Trail and the remainder, the southern part, only by boat or cross-country hiking. The south entrance road meets the lake at Grant Village, one of two main lakeside villages, and includes another campground (403 site), a hotel and a visitor center. The lake is pretty to look at, and is popular for fishing and boating - the latter activity very much weather dependent as sudden storms can occur at any time of year and make conditions very hazardous. The water is generally too cold for swimming, and the whole surface is frozen solid for several months in winter. The highway divides 2 miles north of Grant Village; left leads to Old Faithful and the Upper, Midway and Lower Geyser Basins while straight on follows the edge of the lake then leads to the Grand Canyon of the Yellowstone River. 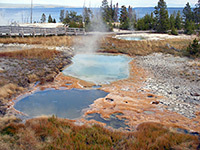 But just east of this junction is one of six main geothermal centers in the park, West Thumb Geyser Basin. 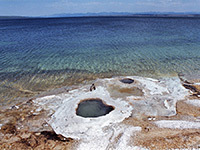 West Thumb is a small basin compared with others to the west, and most of its geysers have become dormant in recent years (now they are just bubbling pools), but it has the added attraction of being right next to Yellowstone Lake and in fact extends some way beneath, with several underwater geysers discovered as recently as the 1990s. 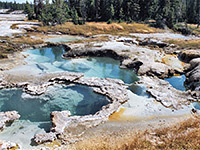 The basin contains many colorful hot pools and springs, steam vents and mud pots, and two circular boardwalk trails totaling 0.75 miles pass the all main features which include the Thumb Paintpots, Seismograph and Bluebell Pools, Twin Geysers, Ephedra Spring, Percolating Pool, Surging Spring, Black Pool and the large, 53 foot deep, blue-green Abyss Pool. 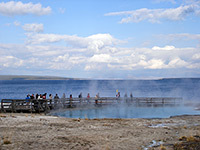 One famous vent right next to Yellowstone Lake, sometimes surrounded by shallow water, is Fishing Cone - a hot spring and very occasional geyser where early visitors, having caught a fish in the lake, were able to cook it whilst still on the line by lowering it into the pool for a few minutes. Nearby Lakeshore Geyser is a small pool/geyser also right at the water's edge, or at times semi-submerged. The West Thumb basin used to have quite a lot of building development including a campground and gas station but all were removed in the 1980s to provide a better, more natural visitor experience, and the facilities relocated to nearby, newly built Grant Village. 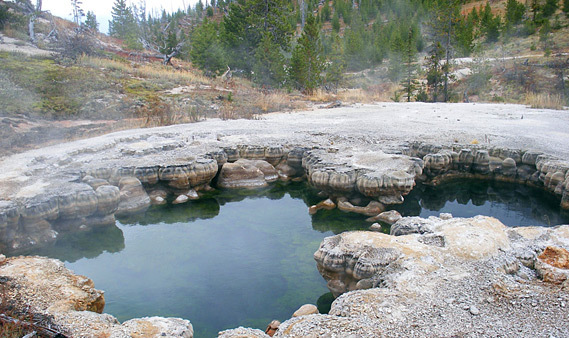 There are several other pools at the edge of the forest by the carpark, and more extending along the shoreline northwards for about half a mile, though these are not accessed by any trail; the only two paths nearby are to Duck Lake and an overlook of Yellowstone Lake. One mile north of West Thumb, Potts Hot Spring Basin is a similar area of pools, vents and white mineral deposits (see 360 degree panorama), though this is fenced off from the highway and has no trails or signs, so it appears the NPS does not want anyone to enter. But the area is easy to reach, by parking at roadside and walking down through the pine trees. The absence of protective boardwalks means that more caution is necessary, especially since some of the ground is quite unstable. Because Grand Teton National Park begins just south of Yellowstone, there are no towns with hotels until Jackson, 57 miles away - follow the link for descriptions, map and hotel reservations.